This morning has appeared a curious page on the BlackBerry web, whose termination "donotpublish" has suggested to many that it was a mistake, and in fact, this link has ceased to be accessible to the public. 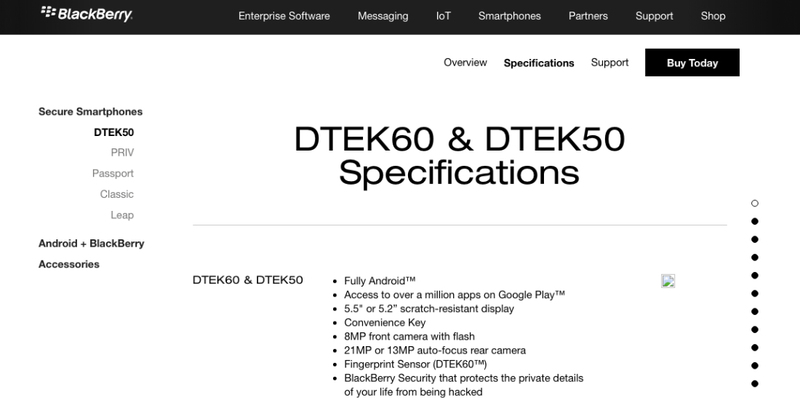 However, thanks to all the time it has been openly on the Internet, we have the official confirmation of DTEK60 and confirmed especifications about it. This is the next flagship of the Canadian company, which had been called by the codename of Argon. In fact, since July we know that BlackBerry had scheduled the launch of three Android smartphones from this summer to early 2017, but until now on the market shelves only had the DTEK50, the most modest of the three (with 5.2 inches and 3 GB of RAM). Now, leafing through the document for internal use, which ended somehow in the public pages of the website of the company, we can confirm a number of details of the device already in the air as rumors: the smartphone will be called DTEK60 and will include a multi-touch Full HD screen of 5.5 inches, cameras of 8 and 21 megapixels, fingerprint reader and an additional key with customizable features. To these features must be added a USB type C port, battery of 3000 mAh, and the Snapdragon 820 processor along with 4 GB of RAM and 32 GB of internal storage. The incriminated and incriminating page, despite everything, omits some important information. As the absence of any reference to the date of appearance of this device or its manufacturer, while taking into account the past references, it is easy to make assumptions: the BlackBerry DTEK50 is in fact based on the smartphone Alcatel Idol 4 so it is easy to imagine that the DTEK60 be based on the Idol 4 Pro from the same manufacturer, even because the specifications of the two devices are identical. Less predictable is the price, since, in this context, the Canadian group in recent years has not really surprised in a positive way.